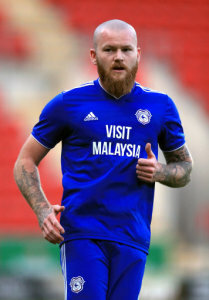 Aron Gunnarsson is back from the World Cup, has seen some pre-season action and is now preparing for the new Premier League season. The Icelandic skipper scored Cardiff's first ever PL goal back in 2013 in the 3 - 2 win over Manchester City. “You look at the teams who have worked their way up like Bournemouth and Burnley, and it’s about creating a togetherness in the team to go that extra mile for success and I can see that in our players," Gunnarsson told the official website. “They’re willing to go that extra mile and do anything to get that success and I’m hopeful we can stick together as a team and make that happen. “It’ll be tough because we know how strong this league is but I’m looking forward to the challenge, just to see how the team reacts. Maybe when we lose three games in a row as that’s when the real character shows through and it’s down to us to react to that. "The professionalism in this squad is second to none and we know what is expected of us. We know our strengths and we need to build on that. We’ve got a lot of leaders at this Club and that’s only a good thing." Full interview on Cardiff City TV, the club's subscription channel.